Considering purchasing the Denon MC4000? Have questions? Ask people who've recently bought one. Do you own the Denon MC4000? Why not write a review based on your experience with it. Solid and efficient controller from Denon who make some of the best DJ equipment. Very well priced for the build and sound quality and perfect for the entry or advanced level DJ professional looking for a controller that does the basics and does them very well. Compact enough to make it easy to travel and work in small DJ booths or bars. Has balanced master and booth outs with 2 mic inputs that have EQs and echo effects. QUALITY! DJKit thank you for the fast delivery. Denon MC4000 Solid bit of kit. Got an MC 4000 as a substitute as my MC 7000 wouldn't fit in the venue booth. Has all the class and functions needed to bring punters to the dance floor. OK are less than the 7000 but not enough to put anyone off getting the 4000. Highly delighted both with service and the controller. This is very solid unit, hard to destroy and prepared for heavy usage. Proper Denon. Finally Denon placed only most important buttons & knobs, so the controller doesn't look any more like a christmas tree! Excellent move! I've upgraded from Traktor Kontrol S2 (which I also liked a lot, but had several issues with latency which I couldn't solve, so had to find something better). Had also in my hands Pioneer SB3 and Pioneer SR2.. they are not as good as this Denon! And MC4000 connectivity - just kills competition. DJ Kit - rocks again with its superb quick delivery and accepting my return of Pioneer SB3 and immediately swapping with this awesome Denon (with me paying the difference of course). The best DJ shop in UK! This a great controller the only thing is I wish I had got it before now it is so easy to use and the quality is very good . Got this in the Black Friday sales. Great bit of kit. The jogs are excellent and responsive. Sound quality is top notch. Long throw pith-faders make beatmatching with the fader/jogs very accurate. Works flawlessly on 1ms USB latency setting on Serato on my 2011 macbook pro. Ticks all the boxes for a mobile DJ, size, features, stability, and you can use it with Virtual DJ 8.2 as well as with Serato! Awesome stuff! As usual DJkit.com came up trumps with outstanding service and next day delivery. Good stuff guys! I've been using mine for a few weeks now and I must say I'm extremely impressed. I'm used to using other pro equipment including CDJ's and other controllers and this unit feels great. It has all the connections you could ever need, both XLR and jack microphones, XLR and RCA out and an AUX RCA in as well which I've used when a guest DJ came in to do his spot. To get all these connections allowing you to use this as a truly standalone unit without having to go through a mixer at this price point is truly outstanding. The sound quality is excellent, can't fault it. Microphone EQ adjustment is there which is a must so that box is ticked too. All the effects and controls you will need are there, sampler, effects, loop, auto-loop, pre-fade, EQ, built-in filters and even controversial SYNC! The jog wheels feel just right with the right amount of torque. This is as good if not better than controllers twice the price and has all the features if not more than some. Works an absolute treat with my Serato DJ setup. On top of all this, it looks gorgeous! Buy it with confidence, this is a superb product. 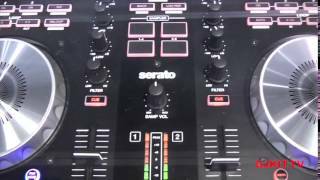 Seen a video for Denon MC4000 online or have you own video? 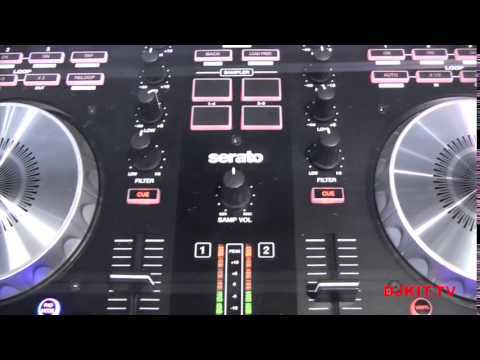 Check out Denon MC4000 on DJkit.com!